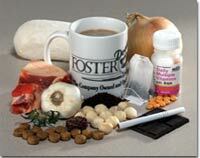 There are many foods that can be deadly or harmful to the health of your dog. Everyday snacks, such as nuts and grapes, can actually be very harmful to dogs. Grapes, onions, raisins, macadamia nuts, baker's chocolate, and caffeinated products are all known to be toxic. Be sure to keep the ASPCA Poison Control number (888-426-4435), as well as your vet’s phone number, available for any emergencies your puppy or dog may have. * Miniature Schnauzers are also prone to health issues as a result of being over weight. Do not allow your dog to become over weight and make sure they get plenty of exercise. You greatly shorten their life expectancy when you allow them to get fat!